Effect: A pack of cards divides to reveal a chosen card. Secret: Ask someone to take a card, look at it and remember it. Point to the top card of the pack. 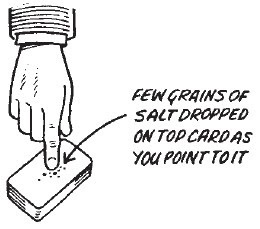 As you do this you secretly drop a few grains of salt on the top card. The spectator puts his card on the top of the pack and the pack is then cut, so the chosen card is hidden somewhere near the centre. Hit the edge of the pack with the heel of your hand and, thanks to the secret salt, the pack will divide at the chosen card.